Left to right, seated: Jill Lui, Pat Jegge, Jane Kihlstrom, Meg Haber, Charlotte Best, Phyllis Flail and Sandy Culpepper; standing: Pat Paulsen and Barbara Engelhardt; absent: Fran Fowler and Mary Kim. 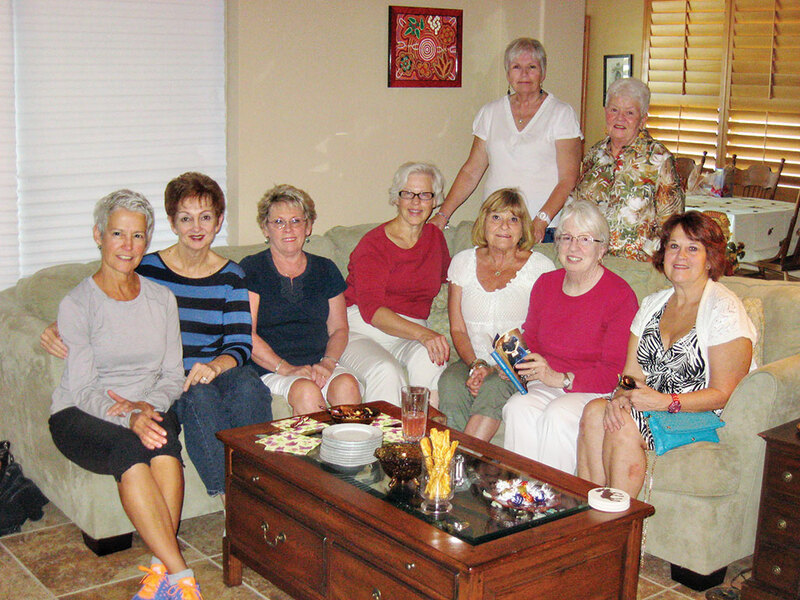 The Sonoran Sisters was the first book club at Robson Ranch, which began in November of 2009. Since then changes have occurred, but many of the “founding mothers” are still with the club. At the beginning we met at participants’ homes in the evening. We changed to luncheon meetings at the Robson Ranch restaurant for a year. We are back to meeting in homes, but we meet at noon on the first Monday of the month with everyone bringing a sack lunch. The hostess selects the book for the month. This works out well since we have 11 members, and we skip a month in the summer. The hostess serves wine, assorted drinks and a dessert. Since so many of our members are on special diets, we may have to rethink the dessert. Many of the drinks and desserts have been tied to the theme of the book like the margaritas, chips and salsa served by Phyllis when we read a book about Mexico. For the November meeting we read Sycamore Row by John Grisham. This led to a lively discussion. At the end we each ranked the book from one to 10. This book got a rating of seven to eight, which is very good. Next month we will discuss The Fault in Our Stars by John Green. Although this is marketed as a book for young adults, we decided it would be a good read. Books lined up for the coming year are The Dark Witch by Nora Roberts; 11/22/63 by Stephen King; The Painted Veil by Somerset Maugham; Mrs. Lincoln’s Dressmaker by Jennifer Chiaverini; Wild Swan by Jung Chang; and The War Brides by Helen Bryan. We have a rule that we only read one book by an author, which provides a great variety as you can see.